Happy New Year to you all – this is my first post of 2018 as I am doing ‘slow’ January and easing myself into the new year. January is always such a long depressing month after all the sparkle, fun and wonderful overindulgence in December! And to make it worse everywhere you look there are articles or programmes about diets and punishing exercise regimes to make it even harder! January should be about nurturing and looking after yourself – eating real food, moving a bit more, getting some proper sleep, perhaps planning a holiday but overall being good to yourself. Think of it as your launchpad for the year. In keeping with my ‘slow’ January mission I have decided to try and ‘crack’ slow cooking – now I am a fairly good home cook so you would think that using a Slow Cooker would be a ‘piece of cake’ but my Slow Cooker has been seriously neglected and gathering dust in the back of my kitchen press for the last 3 years! Truth is I just didn’t give it the time to try and get to know how it worked by using it regularly enough. The good news however is that I have ‘cracked’ it and I am now ‘slow cooking’ my way to freedom! I always thought you had to have special recipes for it but you don’t – you can prepare stews / casseroles the very same way you would for the oven except you reduce the amount of liquid you use. This is because in the oven the liquid evaporates and this doesn’t happen with slow cooking. It is that simple, believe me. It doesn’t need any minding, stirring or turning and you can’t really ruin anything as most food improves the longer and slower it is cooked! Win, win, win – you can go to bed and leave it overnight, go to the cinema, play a round of golf, go out for a walk (work if you must) and when you come home dinner is there waiting for you all full of flavour and piping hot, not even a spin in the microwave needed! In our house people are coming in at different times in the evening after college, work, training etc and it is the ideal way to cope with this as the food stays hot in the Slow Cooker all evening and doesn’t get ruined or end up stuck to the pan as it would if it was in the oven. So after all that, what’s not to love?? Do yourself a favour and get online or to your nearest electrical store to buy one of these time-saving beauties – the one in the picture is the one I use which is a Morphy Richards Sear & Stew Slow Cooker (6.5L) that costs approx. €56 and is the perfect size for a family of 4 adults. I love it because there is an inner pot in which you can brown the meat on the hob and then just transfer it into the cooker – no big wash up. So far I have used it to cook beef stew, lamb tagine, butter bean & chorizo stew, poached whole chicken and chicken stock. 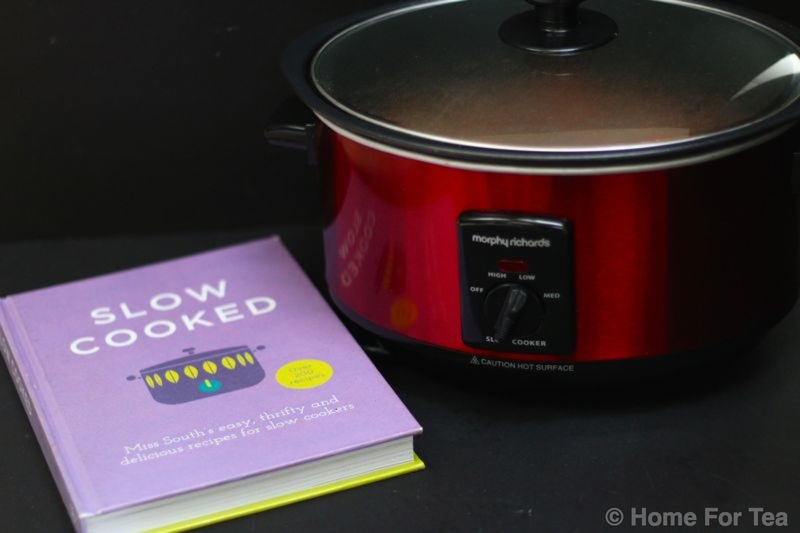 So here are some tips for successful slow cooking! If you’re short on time in the morning, prepare everything you need for your slow-cooked meal the night before, put it into the slow-cooker dish, cover and store in the fridge overnight. Ideally the dish should be as close to room temperature as possible, so get it out of the fridge when you get up and leave it for 20 minutes before turning the cooker on. Because your slow cooker has a tightly sealed lid, the liquid doesn’t evaporate so if you’re adapting a standard recipe, it’s best to reduce the liquid by roughly a third. Liquid should just cover the meat and vegetables. Don’t overfill your slow cooker or it may start leaking out the top and food won’t cook as well. Half to two thirds full is ideal and certainly no more than three quarters. Just as the the liquid doesn’t reduce it also doesn’t thicken. You can toss meat in a small amount of seasoned flour before adding it to the slow cooker or you can use cornflour by mixing a teaspoon or two of cornflour with a little cold water and stirring it into your simmering slow cooker dinner, then replacing the lid. Use the ‘Low’ setting as much as you can, finding most dishes really benefit from a slow, gentle heat to really bring out the flavours. This also means you won’t need to worry if you’re heading out for the day, it’ll take care of itself. Slow cookers are designed to do their own thing so you don’t need to keep checking the contents. Everytime you take the lid off it will release some of the heat, so if you keep doing this you may have to increase the cooking time. How long should I cook it for? I hope you find this helpful and that it will help you enjoy some slow time! My next post will be for a wonderful easy slow cooked lamb tagine.